Code for America is working to transform the way government delivers services to those most impacted by the criminal justice system. In the U.S. today, 1 in 3 people have a criminal record that appears on a routine background check. That means that 70 to 100 million people are left out of the workforce, unable to get student loans, housing and face a host of other obstacles to living a self-sustaining life, even though they have paid their dues to society. Nearly every state has passed laws that allow people to clear or change their criminal record, recognizing the impact on the economy and on the lives of families when millions are shut out of the workforce or unable to fully reintegrate into their communities. But a small fraction of the tens of millions of eligible Americans have actually benefited from these laws because of the process is overly complicated, costly, and takes too much time. At Code for America, we believe government can work dramatically better than it does today, and the criminal justice system is one of the areas where we are most failing the American people. In 2016, we launched Clear My Record as an opt-in service for people seeking record clearance. However, we quickly recognized government is not equipped with the proper tools to support reentry and systems for decriminalization efforts. To help the government implement record clearance at scale, we shifted our focus and built Clear My Record (Automatic) to support a full systems change. After several years of work in this area, we are in the position to help millions get out from under the burden of a criminal conviction. In May 2018, Code for America launched a pilot to help the government automatically clear all eligible criminal records and remove a significant barrier to work, education, and housing for people. The core technology reads a criminal record, then maps data to determine eligibility for relief under the applicable statute, and completes the appropriate forms to be filed with the court. We will pilot this technology in 3 to 5 counties in California, partnering with district attorneys and starting with the record clearance or reduction remedies available under Proposition 64 (marijuana legalization). Our goal is to help clear 250,000 eligible convictions by 2019. Our vision is to create a blueprint for automatic record clearance of all eligible criminal records in California and across the country. 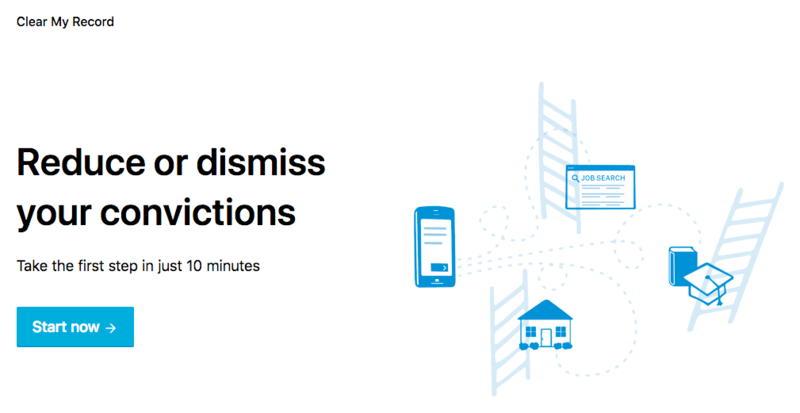 We are working with government to fundamentally rethink the process of record clearance, leveraging technology and user-centered design to reinvest in communities by removing barriers to employment, housing, health, and education. 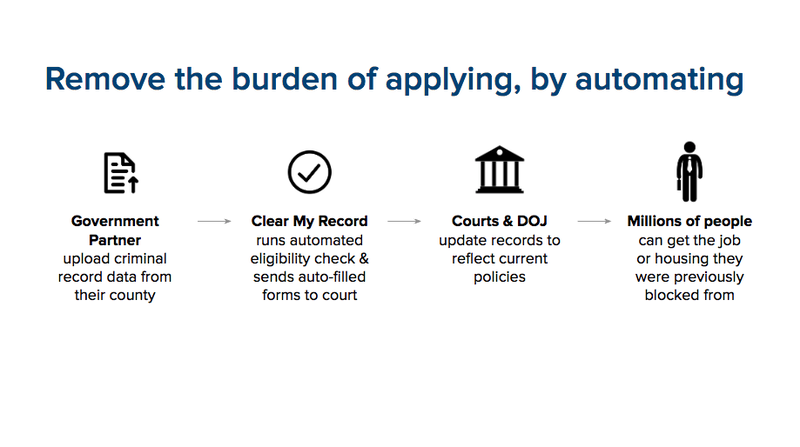 How Clear My Record leverages technology and design to advance automatic record clearance reforms to clear every eligible record across the U.S.